Clean out and restore your PC to its pristine state. After downloading Malwarebytes, run the setup file and follow the wizard to install the program. Once the program opens, keep the default scan option (“Threat Scan”) selected and click the Start Scan button. It should check for updates before it runs the scan, so just make sure that happens before you proceed. Once the scan is complete Malwarebytes will show you the results. 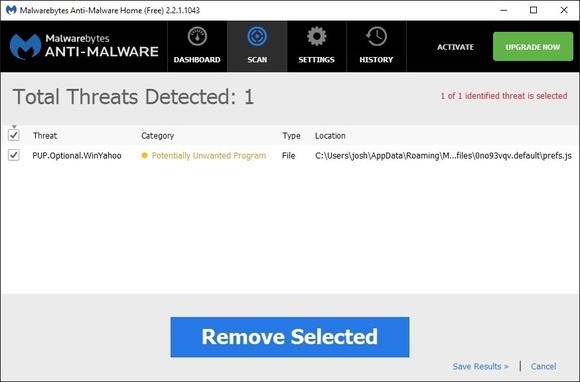 If the software gives your system a clean bill of health but you still think that your system has acquired some malware, consider running a custom scan with Malwarebytes and trying the other scanners mentioned earlier. If Malwarebytes does find infections, it’ll show you what they are when the scan is complete. Click the Remove Selected button in the lower left to get rid of the specified infections. Malwarebytes may also prompt you to restart your PC in order to complete the removal process, which you should do. If you can’t seem to remove the malware or if Windows isn’t working properly, you may have to reinstall Windows. But before wiping your hard drive, copy all of your files to an external USB or flash drive. If you check your email with a client program (such as Outlook or Windows Mail), make sure that you export your settings and messages to save them. You should also back up your device drivers with a utility such as Double Driver, in case you don’t have the driver discs anymore or don’t want to download them all again. Remember, you can’t save installed programs. Instead, you’ll have to reinstall the programs from discs or redownload them. Always make sure that you have a real-time antivirus program running on your PC, and make sure this program is always up-to-date. If you don’t want to spend money on yearly subscriptions, you can choose one of the many free programs that provide adequate protection, such as Avast, AVG, Panda, or Comodo. You can read more about how to find the best antivirus program for your needs right here. In addition to installing traditional antivirus software, you might consider using the free OpenDNS service to help block dangerous sites. 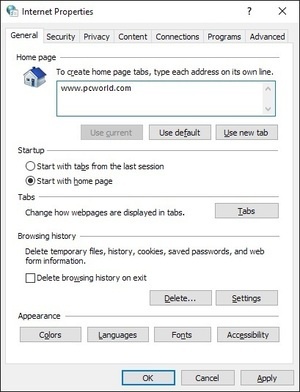 And if you frequent shady sites that might infect your PC with malware, consider running your web browser in sandbox mode to prevent any downloaded malware from harming your system. Some antivirus programs, such as Comodo, offer sandboxing features, or you can obtain them through a free third-party program such as Sandboxie. When you think that you’ve rid your PC of malware infections, double-check your online accounts, including those for your bank, email, and social networking sites. Look for suspicious activity and change your passwords—because some malware can capture your passwords. If you have a backup system in place that automatically backs up your files or system, consider running virus scans on the backups to confirm that they didn’t inadvertently save infections. If virus scans aren’t feasible, as is the case with online systems since they usually will only scan a drive attached to your PC or just the C: drive, consider deleting your old backups and resetting the software to begin saving new backups that are hopefully free from infections. Keep Windows, other Microsoft software, and Adobe products up-to-date. Make sure that you have Windows Update turned on and enabled to download and install updates automatically. If you’re not comfortable with this, set Windows to download the updates but let you choose when to install them.